Common Name: Mulberry, Morus fruit. Part Used & Method for Pharmaceutical Preparations: The ripe fruit is gathered from April to June. It is cleaned and dried in the sun. 1. Thirst and dry mouth due to deficient body fluids or diabetes manifested as thirst with desire to drink, profuse urine and lassitude. Mulberry (Sangshen) is used with Ophiopogon root (Maidong), Grossy privet fruit (Nuzhenzi) and Trichosanthes root (Tianhuafen). 2. Deficient yin and blood manifested as dizziness, vertigo, blurred vision, tinnitus, deafness, insomnia and early graying of hair. Mulberry (Sangshen) is used with Fleeceflower root (Heshouwu), Grossy privet fruit (Nuzhenzi) and Eclipta (Mohanlian) in the formula Shouwu Yanshou Dan. 3. Constipation due to dryness in the intestines. 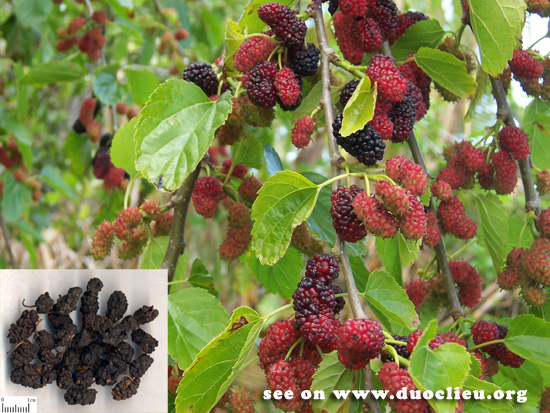 Mulberry (Sangshen) is used with Black sesame seed (Heizhima), raw Fleeceflower root (Heshouwu) and Hemp seed (Huomaren).